See plans for the new Hale Library! You want of-the-moment updates? You know you can find them here on the blog! Looking for something more? 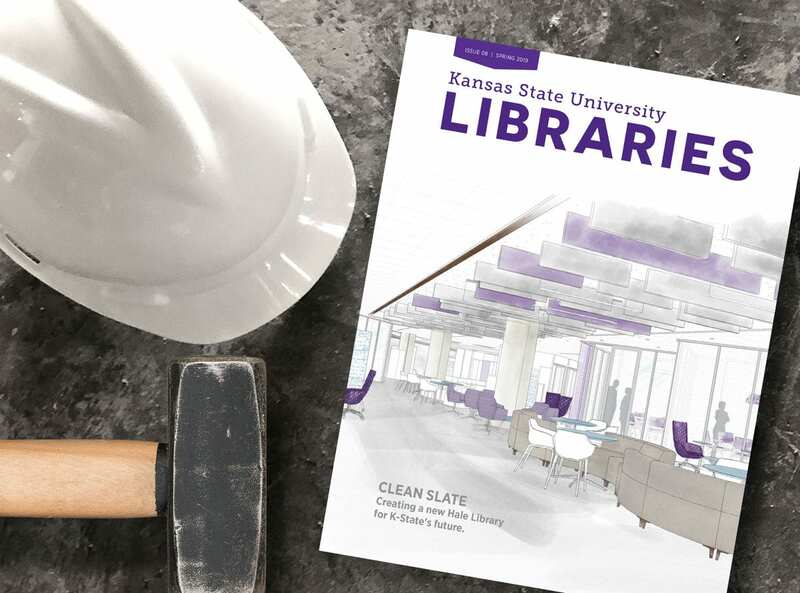 Don’t miss the latest issue of K-State Libraries Magazine. Our spring 2019 issue is online and in mailboxes now! 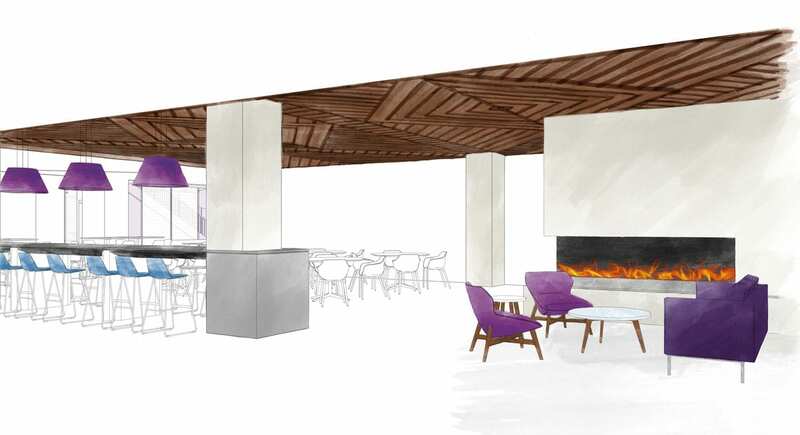 We’ve got a big-picture update on the future of Hale Library, including a sneak peek of the Dave and Ellie Everitt Learning Commons, opening fall 2019. You’ll also find dramatic renderings of the Innovation Center and working designs for new study spaces, meeting rooms and more. Want the latest news about insurance reimbursements? 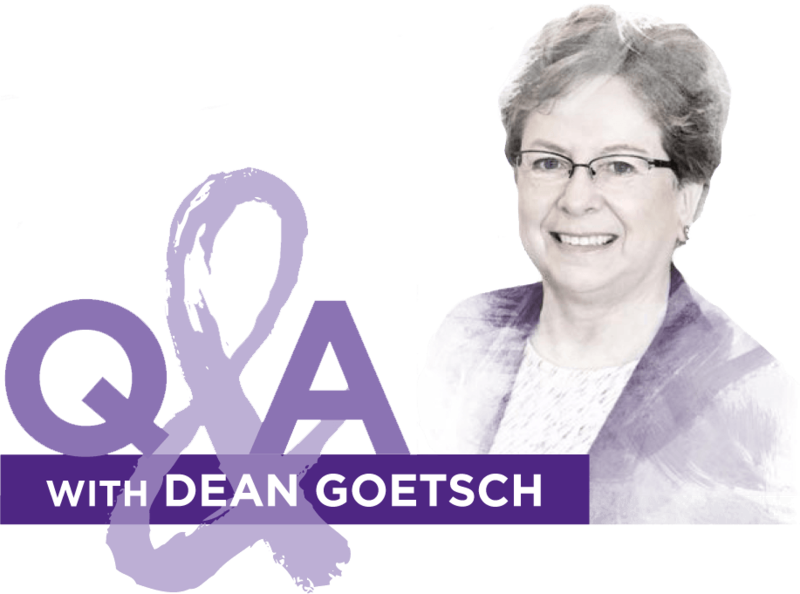 In our Q&A with Dean Lori Goetsch, she shares all there is to know about insurance and the cost of renovating Hale Library. And when will all of this happen? The building will reopen in phases, with the Dave & Ellie Everitt Learning Commons opening up first, in fall 2019. Old meets new in a renovated first floor café space named for the Hale Family. Additional naming opportunities exist throughout the renovated building. Of course, Hale Library won’t live its best new life without our friends and supporters. If you like what you see in the magazine preview, visit Help for Hale to join in our effort to create a next-generation library. What about the books? Thanks to hundreds of workers who put in thousands of hours, more than 1.5 million collection items were packed out in less than 17 weeks. Until Hale Library is renovated, the entire collection will be stored in multiple air-conditioned warehouses across the region. We estimate that all 1.5 million items could be clean by July 2019. Even better news: We anticipate that more than 99 percent of the materials will be saved. 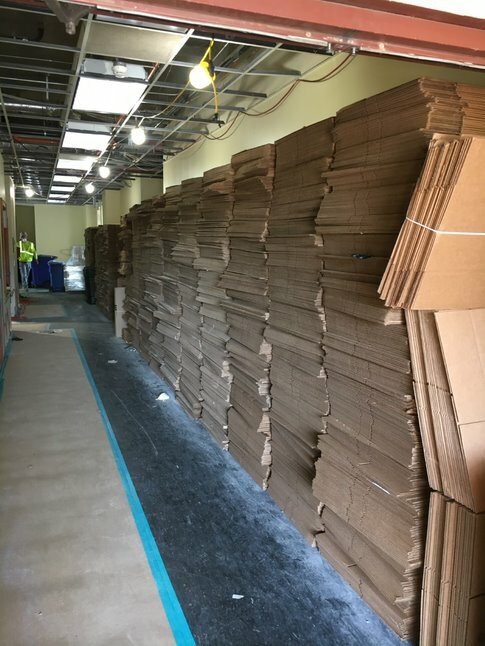 Read more about the process of cleaning and storing more than 147,700 boxes of materials! Melia Fritch and Cindy Logan: professors, office mates, collaborators. Even without the building, K-State’s librarians are working hard to elevate research on the K-State campus. Visit the magazine to read about two librarians who have forged a unique partnership with K-State’s athletic training program. Melia Fritch and Cindy Logan don’t just help students complete assignments, they equip them to excel in their chosen professions. For K-Staters of a certain age, the big campus fire isn’t Hale Library but rather Nichols Gymnasium. Did you know that after a major conflagration 50 years ago, the limestone skeleton of Nichols Gym stood unrestored for almost two decades before it became Nichols Hall? Learn more from the latest installment of K-State Keepsakes in—where else? !—our magazine! Be the first to learn about great stories like these! Don’t miss an issue of K-State Libraries Magazine. Click here to receive a copy in your mailbox. Post-fire, the Richard L. D. & Marjorie J. Morse Department of Special Collections faculty and staff have offices scattered across campus, and their rare books, manuscripts and more have been boxed up and moved to secure storage facilities. But in early October, the department opened a reading room in 116 Bluemont Hall. The space features a small fraction of their collection, including a limited amount of frequently used archival materials plus research tables, a scanner and a microfilm reader. 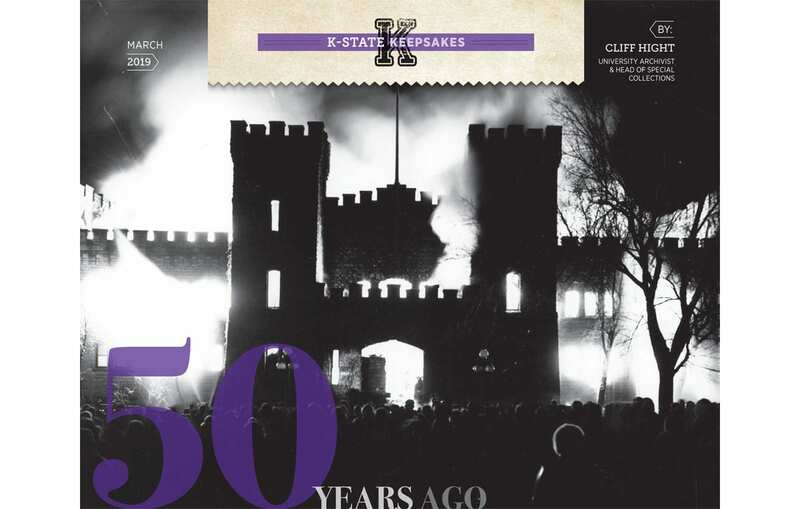 Materials include photos, yearbooks, news clippings and more that cover K-State’s history. Items available for public use include subject clipping files, photo collection files, yearbooks, catalogs, recent budget books, campus directories, Manhattan directories and commencement programs. 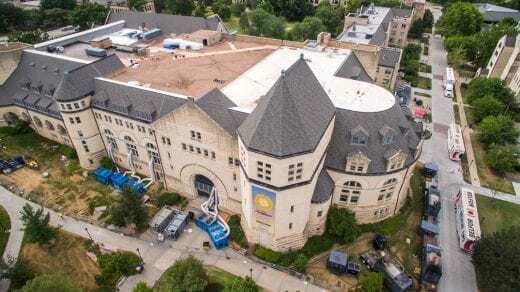 “We’re looking forward to seeing students, faculty and the community engage with our collections again, even if it is on a much smaller scale,” Hight said. 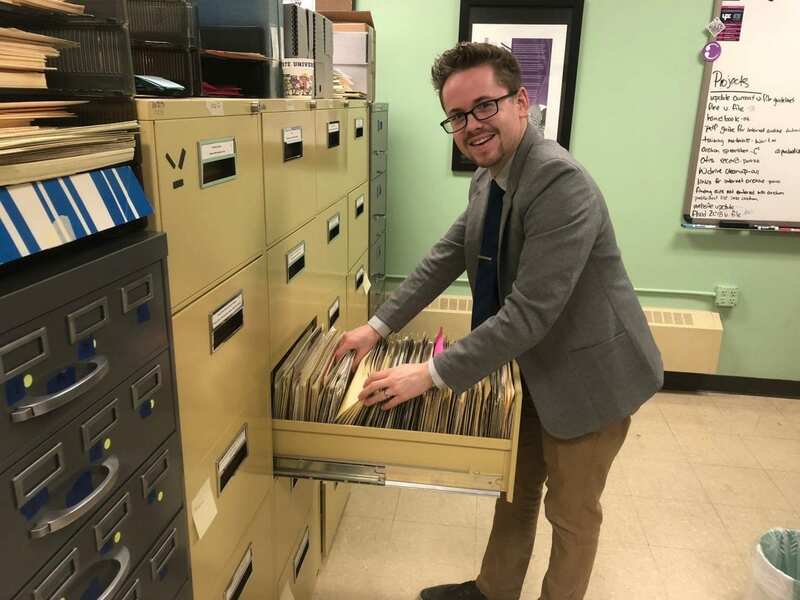 Patrick Dittamo, special collections employee and graduate student in musicology, searches through subject clipping files in the new reading room. 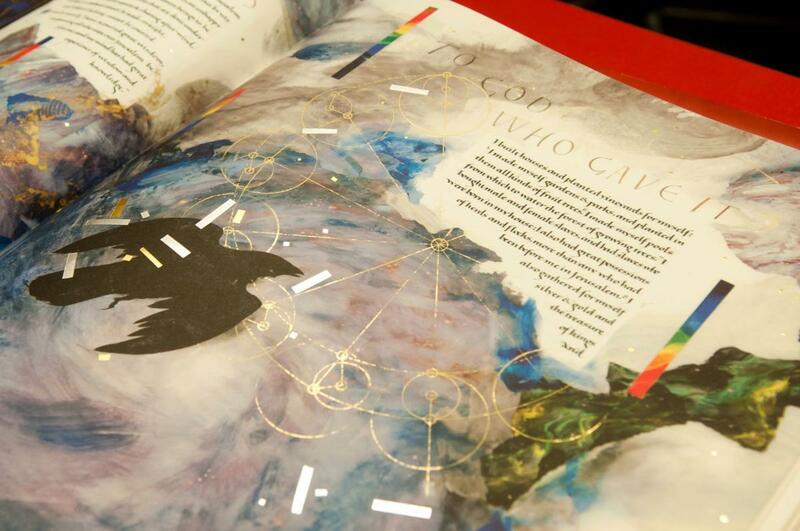 Visitors can also request to view the St. John’s Bible. If you can’t make it to the reading room but would like to bring the St. John’s Bible to your community, our outreach program remains active. The Libraries’ trained docents regularly bring this work of art to organizations throughout the Kansas region. The St. John’s Bible is the first completely handwritten and illuminated Bible commissioned by a Benedictine Abbey since the invention of the printing press. K-State Libraries was gifted a Heritage Edition of The Saint John’s Bible, which is a fine art reproduction of the original. Additionally, a selection of digitized materials from the department’s primary collecting areas is available online. So what kinds of things can you find in the reading room? And who might need them? Let’s say you are a history or journalism student researching the arc of the civil rights movement on the K-State campus. The reading room staff can pull subject clipping files related to your topic. You’d find articles about events, people and conflicts as reported in regional, local and campus publications dating back over many decades. They can also pull files of related photographs, many of which have never been published or digitized. Of course, professional journalists, professors from K-State and further afield and members of the community can also access these resources. 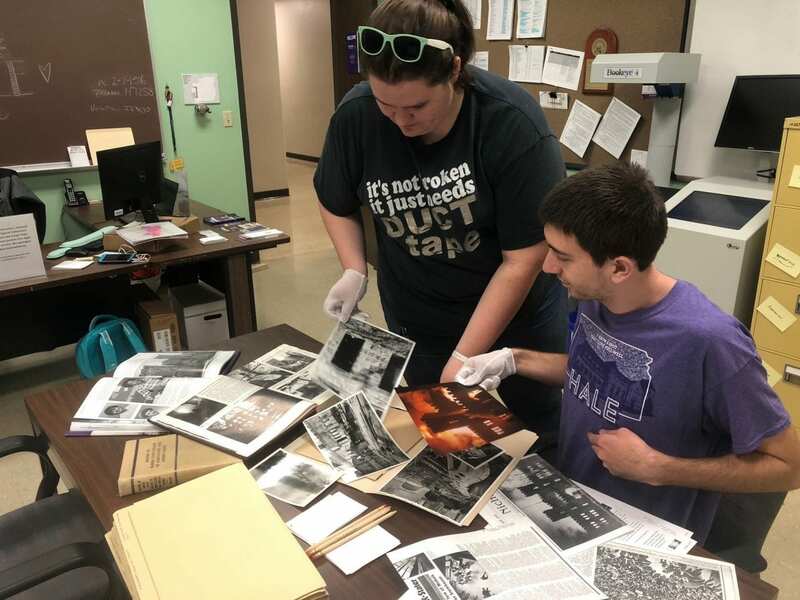 Special collections student employees Alex Wulfkuhle and Jarrod Kuckleman examine an array of materials related to the 1968 Nichols Gym fire. How can I contact the reading room? If you have questions about the holdings, policies or more, call 785-532-7456, 10 a.m.-5 p.m. Monday-Friday or email libsc@ksu.edu. What types of materials are boxed up and stored offsite? Well, for starters, the Morse Department is home to more than 38,000 cookbooks and manuscripts that date back as far as 1487. It might seem arbitrary for a library to have so much focusing on a single subject. A recent addition to the cookery collection, this untitled two-volume set of Austrian manuscript cookbooks dates from about 1790. It was handwritten in German by an anonymous chef who packed nearly 400 pages with recipes of all kinds. Two other collection highlights include topics related to Kansas history and the consumer movement. The Consumer Movement Archives (CMA) was established in 1987 through the initiative of Richard L.D. Morse, a prominent leader in the consumer movement and a Kansas State University professor. Broadly defined, the consumer movement consists of individuals and organizations that advocate for the rights and welfare of consumers, especially when those rights are violated by corporations and governments. This is just a small sampling of the materials included in the department. We look forward to bringing them back to Hale Library once they have a new, improved space. The university’s librarians regularly buy and receive donated materials to grow the collection. Funds come from a range of sources, including private gifts and grants from organizations such as the National Endowment for the Humanities. Librarians are pretty obsessive about tracking everything in their collections. It’s all meticulously cataloged, which allows us to identify where each item is at any given point in time, who has it, and when it’s coming back. Cataloguing pieces of a mural? The oak beams from the Great Room? A 50-pound solid oak acorn finial? That’s a little out of our wheelhouse. The wooden acorn finials (shown on the cart at right wrapped in a green protective covering) weigh 50 pounds each. Fortunately, John Canning Company is in charge of disassembling Historic Farrell Library so it can be put back together better than ever. We’re confident that there will be no Humpty Dumpty situations on their watch. 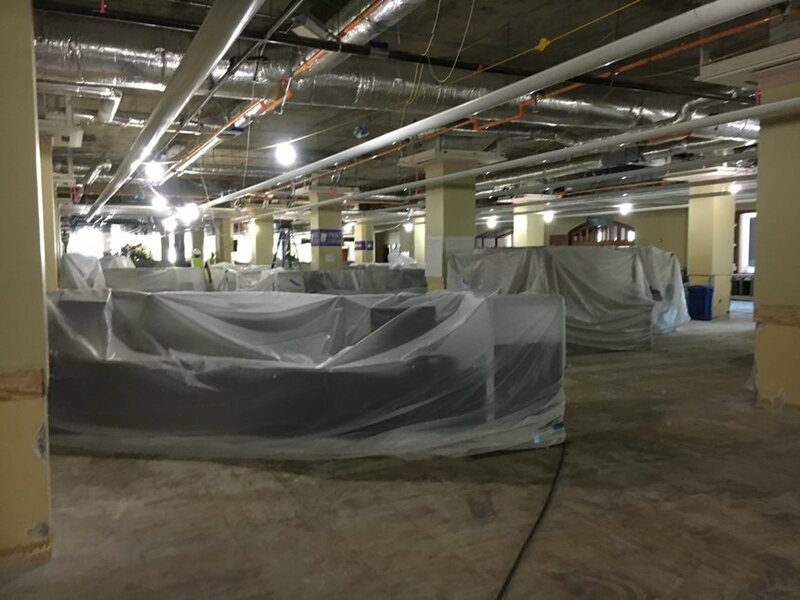 Let’s set the scene: There’s a coupla big ol’ holes in Farrell Library. Charred, scary holes that have been covered by a temporary roof. Until recently, it was difficult to get up close and personal with the ceiling to photograph the fire damage. Below that, you have the dance floor. That’s what they call the temporary plywood floor built on top of the metal scaffolding that fills the entire Great Room. 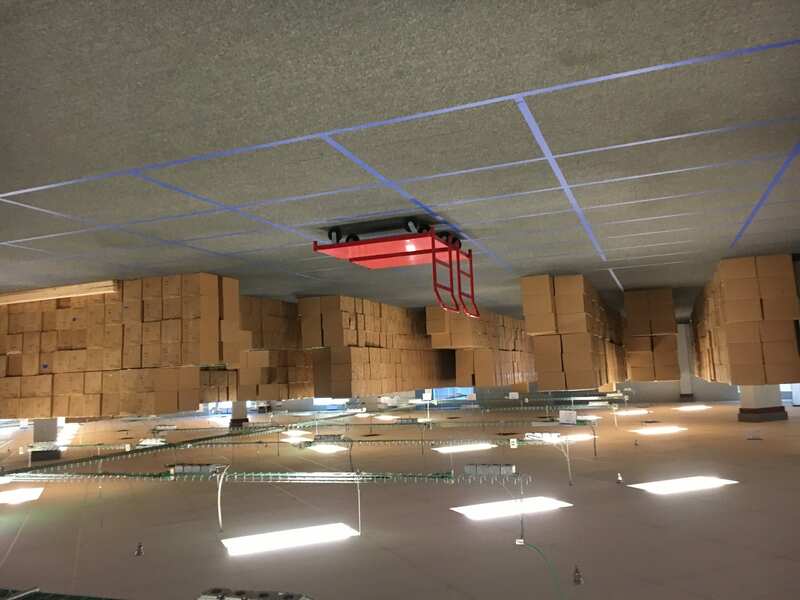 We don’t want to keep those holes, so the dance floor gives workers access to the ceiling where they can begin the process of removing the fire debris to replace the ceiling and roof. 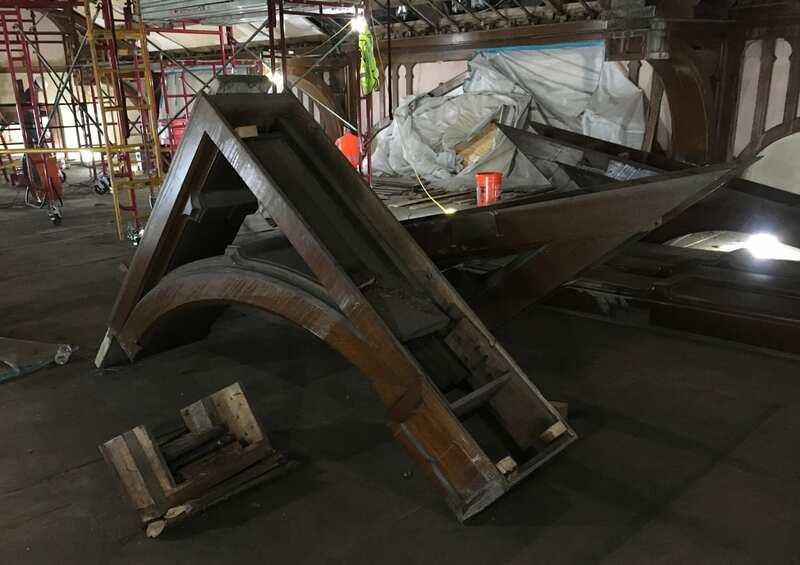 Wooden beams that will be preserved are laid out on the “dance floor.” Every piece is labeled so that once the room has been renovated, it will be possible to reassemble the woodwork. 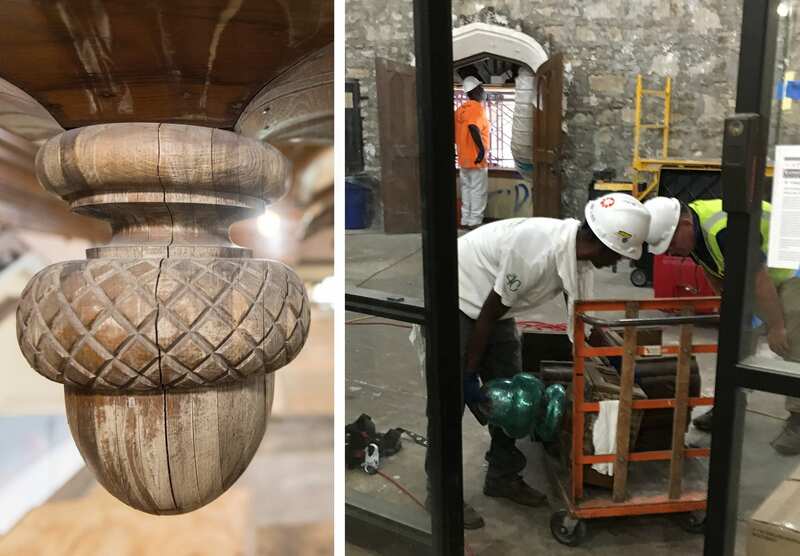 Workers are carefully taking down the woodwork that lends the Great Room much of its historic character. It’s a little like high-stakes Jenga: Removing, labeling and relocating each piece of wood is a delicate process. In order to keep the ceiling repair process moving forward, workers have to take each piece of wood off of the dance floor. Here you can see the scaffolding that supports the floor. 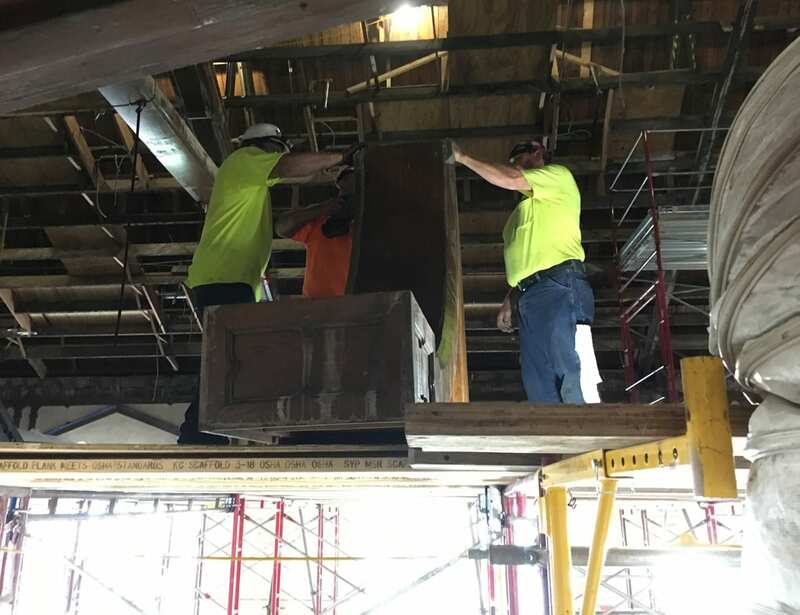 When Farrell Library is sporting a new ceiling and roof sans holes, it will be time to reverse-Jenga all of that woodwork. We can’t wait to see it back where it belongs! 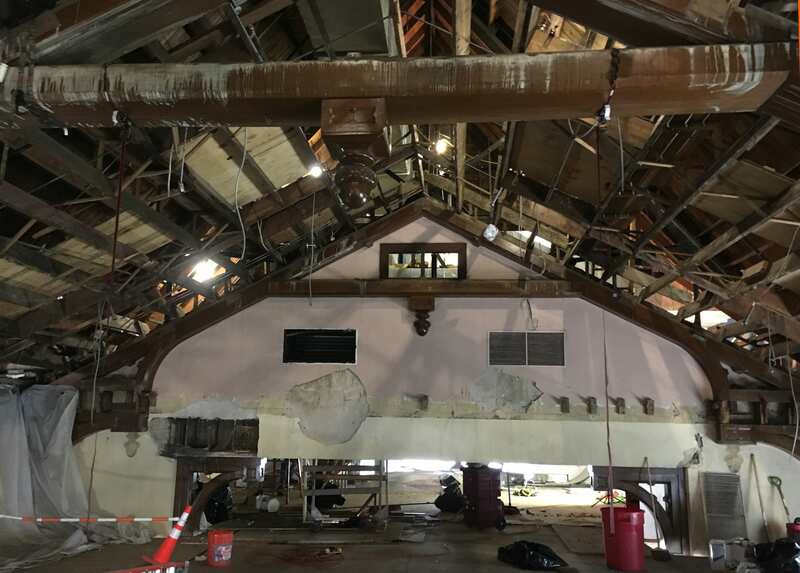 The ceiling has been removed already in this portion of the Great Room, and the rest of the beams will follow. Over in the Richard L. D. & Marjorie J. Morse Department of Special Collections, librarians have been going hands-on to pack out the Libraries’ unique research collections and rare materials. This area of the building mainly experienced smoke damage, and we initially hoped the books and other holdings could be cleaned on site. It’s become clear, though, that in order to keep them safe, everything needs to be transported to secure, reliably conditioned space. Only a few rooms of special collections materials remain in Hale Library. They’re the last of more than 1.5 million items to leave the building and go into storage where they will be professionally cleaned. 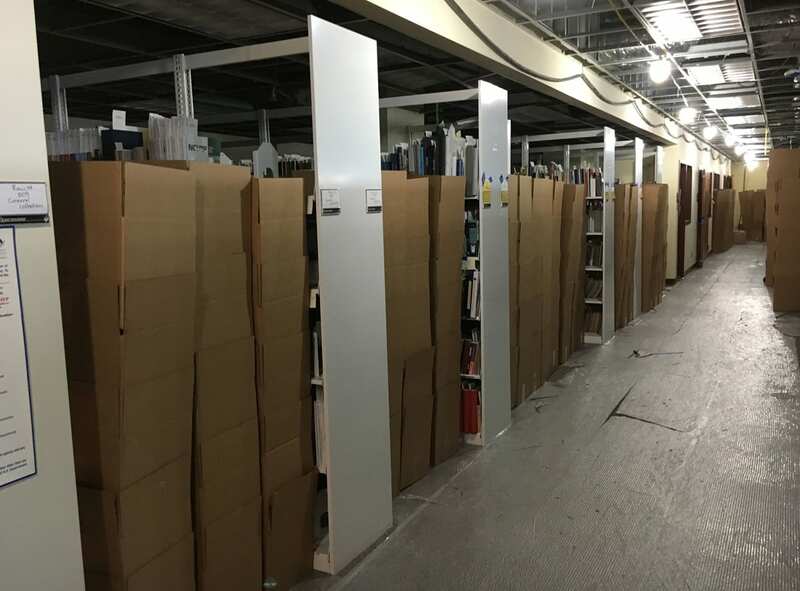 The remaining special collections materials will join the 140,000 boxes that have already been sent to one of the three offsite storage facilities we’ve contracted to keep everything safe. The newest location in our stable of stables is one of Underground Archive & Storage’s facilities, a former limestone mine in Kansas City, Mo. 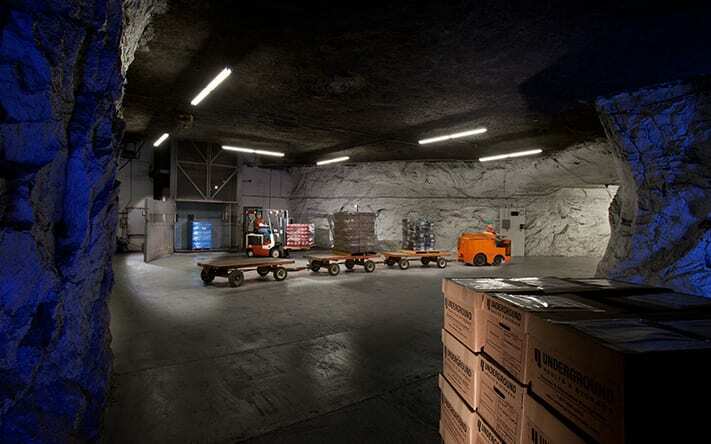 Underground Archive & Storage has facilities across the region; the one we’re using occupies a series of caves created by limestone mining. Given that Hale Library is a massive limestone construction, we think there’s a metaphor here. We’ll let you know when we figure it out. Now, it might not have been the first thing on everyone’s mind after the fire, but we had materials on order that arrived over the summer. We were a little busy, and we weren’t able to make those available … until now! NEW K-State Libraries materials that were destined for Hale Library are being held in Seaton Hall. You can visit Library Help in the Union and ask for the item you want in person; we’ll retrieve it on the spot. Alternately, you can make your request through our website and specify which library help desk you’d like to pick your item up at. 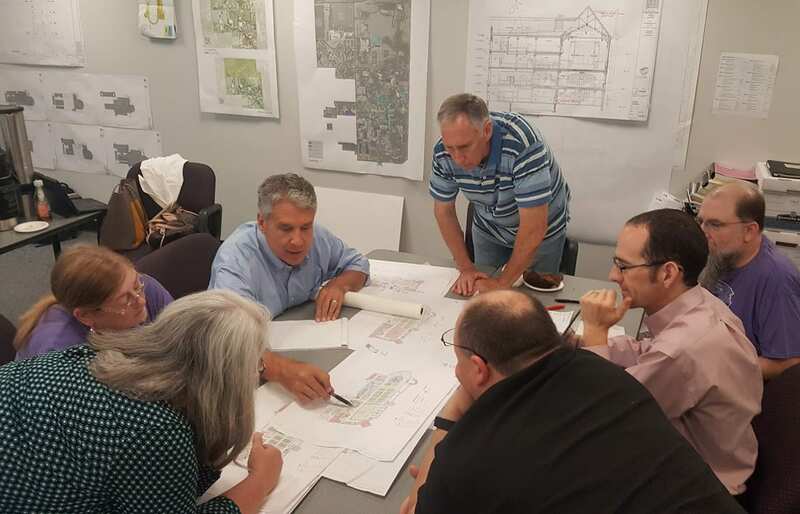 And, as we look to the future, we continue our work with the architects from PGAV. They recently completed “like-for-like drawings”: PGAV determined what the building looked like right before the fire. Now those drawings go to a contractor who assigns what the replacement costs would be if we were to rebuild Hale Library as it was. These are essential steps that have to happen before the various parties involved assign a dollar amount to the total damages. Only after that is completed will we know how much K-State will receive from the insurance companies. 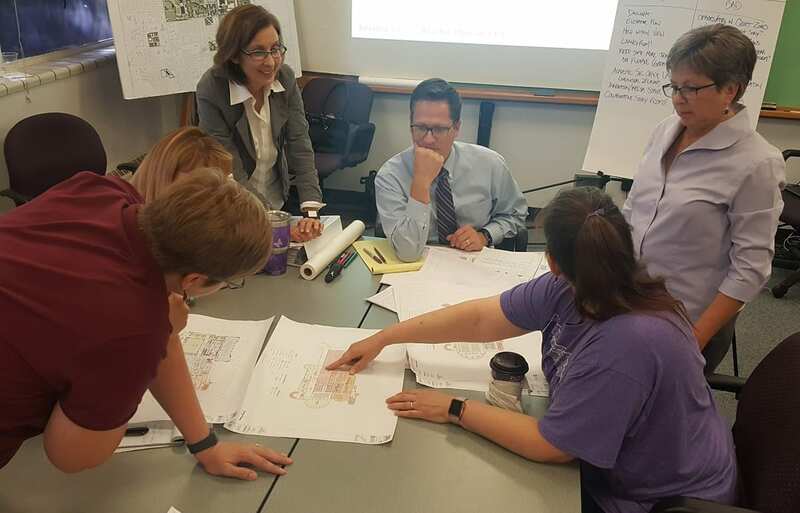 While we wait for information about total damages and insurance, staff are working with PGAV to imagine a library for K-State’s future. Until then, if you ever have questions you’d like us to address in this blog, please comment below or contact us at libcomm@ksu.edu. And to everyone who has been following along with us on this journey, thank you! Your comments and words of encouragement mean the world to us! 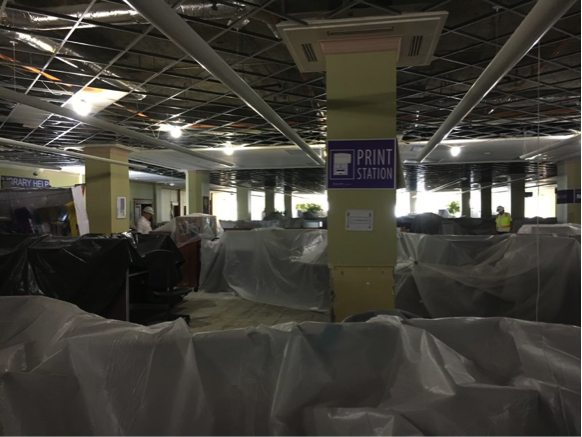 As soon as K-State Libraries and Belfor Property Restoration employees were allowed back in Hale Library after the fire, we removed wet books as quickly as possible. 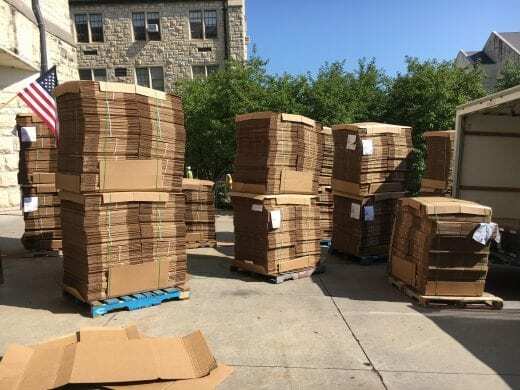 Several weeks ago, we wrote about that process: books were packed out of the building and stored in freezers on campus until they could be shipped in refrigeration trucks to a Belfor facility in Fort Worth, Tex. 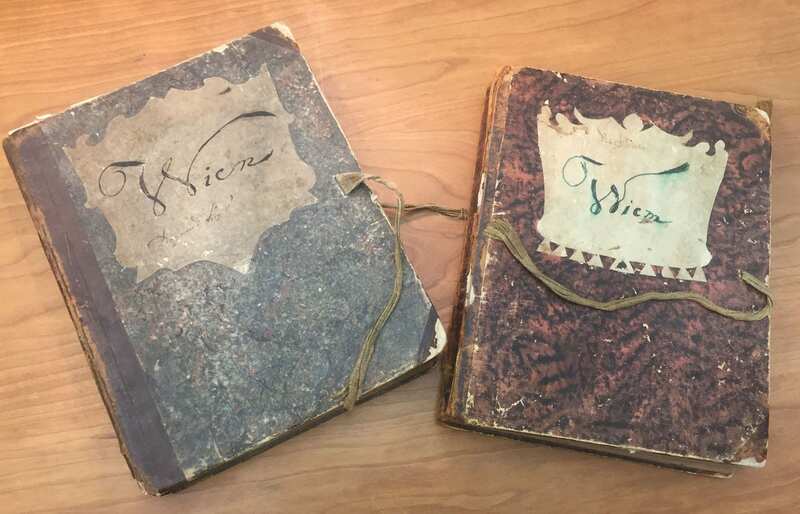 Two weeks ago, Kathryn Talbot, preservation coordinator, and Michelle Turvey-Welch, head of metadata, preservation and digital initiatives at K-State Libraries, went down to Fort Worth to check on our materials. From left to right, Jeff Zieber, Kirk Lively, Michelle Turvey-Welch and Kathryn Talbot at Belfor in Fort Worth. July 23, 2018. A total of 3,500 boxes of wet books were sent to the Belfor facility. Once they arrived, a two-step process of freeze drying and then cleaning the books began. The boxes stay in the freeze drying chambers for about a week. Books that come out of the freeze dry chambers with mold on them are gamma radiated to kill the mold spores, and books with pages that dry wavy are pressed flat. 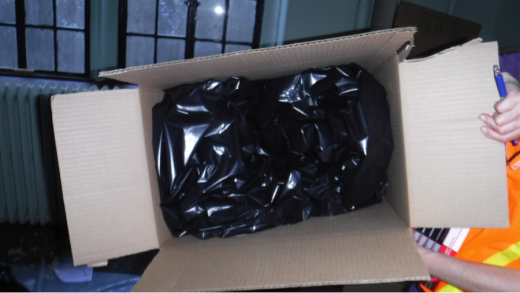 After that, all items that are in acceptable condition will be transported back to Manhattan and stored in a leased offsite facility dedicated to clean materials. Turvey-Welch surveys books that came out of the freeze drying chamber. July 23, 2018. 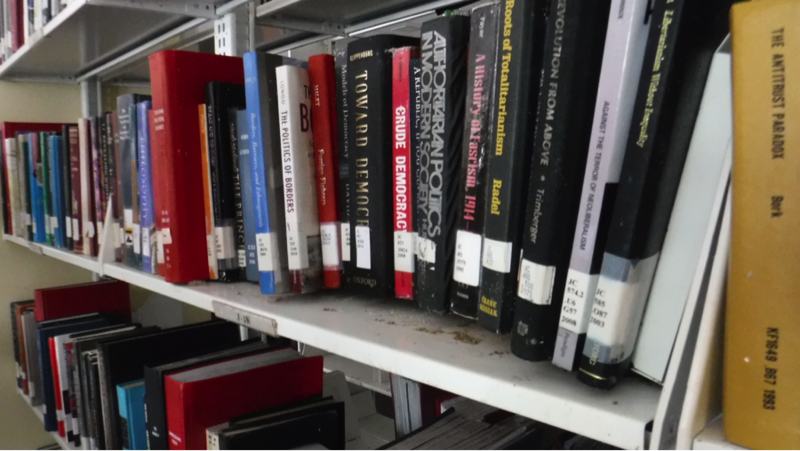 Initially, we hoped that some of the books in Hale Library’s Stacks A-H could be cleaned inside the library. Unfortunately, the temperature and the humidity levels in the building are unreliable. It’s been difficult to ensure the consistent power that’s necessary to run the air conditioning units. 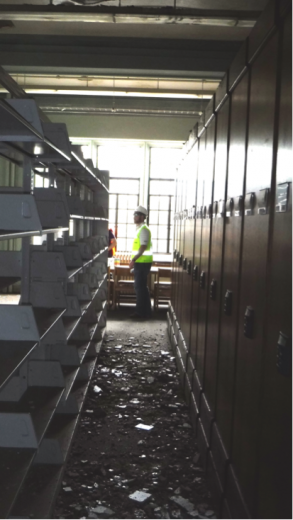 As a result, more than 1.5 million items in Hale Library will be removed and cleaned offsite. We are especially concerned about providing an environment that’s appropriate for materials from the Richard L. D. & Marjorie J. Morse Department of Special Collections. Air conditioning is struggling to reach those items on Stack G and H.
From left: Student employees Patrick Dittamo, Andrew Le and Shannon Harkins were a part of the team that helped to label and inventory approximately 18,000 linear feet of shelving in Special Collections. That’s the equivalent to the length of 60 football fields! July 19, 2018. 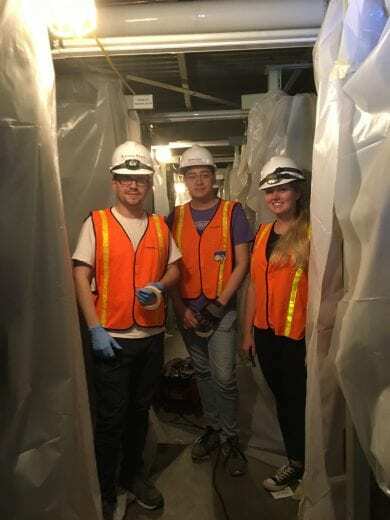 Team members worked under heavy plastic sheeting that is in place to protect materials from water damage. Each shelf was labeled with location, range number, section number, and shelf number so they can be returned to the correct place. July 19, 2018. Currently, Stack A has been emptied and Belfor is boxing and moving Stacks B and G. We are hoping to have the all eight stack levels emptied by the beginning of September. Once those books are removed, they’re sent to offsite warehouse space. 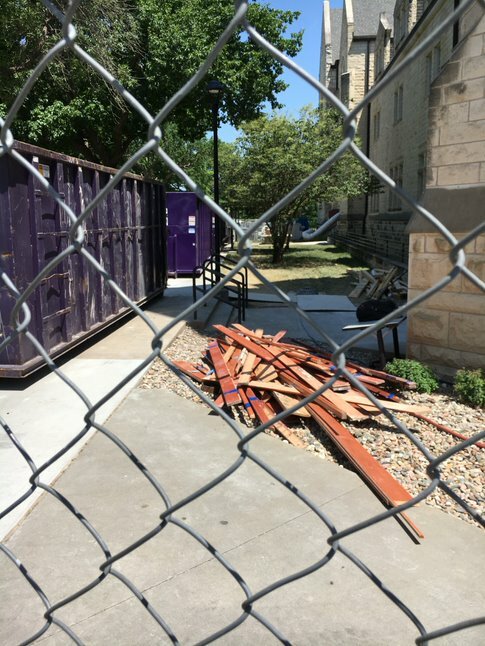 K-State Libraries has leased three separate buildings where dirty materials are stored. 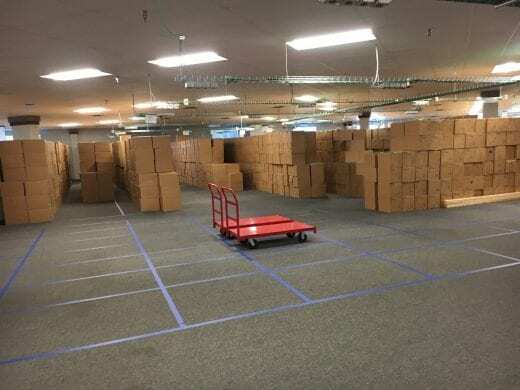 Executive Court, an office building near the airport that was most recently used by the College of Architecture, Planning & Design during the Seaton Hall renovation, has been filled with more than 68,000 boxes of books. 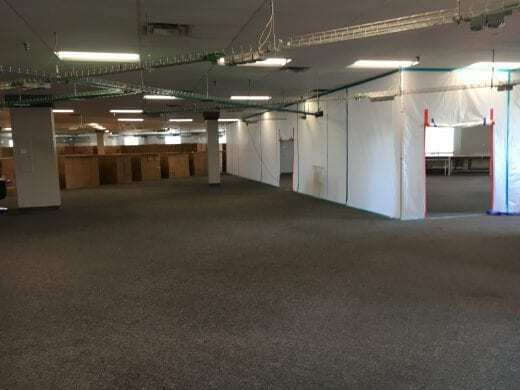 Since we have tens of thousands of additional boxes to accommodate, we’ve also leased space in the Ag Press building in Manhattan and an entire former lumber yard building on the east edge of Junction City. The inside of Ag Press has been prepped with clean plywood floors, and boxes of books are filling up the new space. July 31, 2018. A fresh batch of boxes is unloaded at Hale. They will be used to pack up books and other library material. 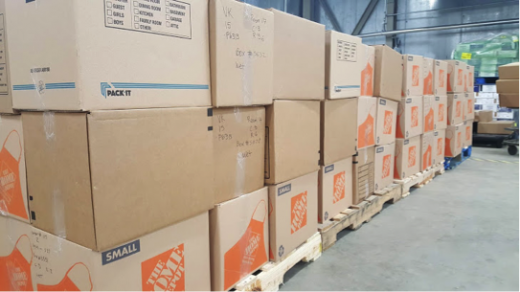 About 14,000 boxes are delivered multiple times a week. July 31, 2018. With the books removed from fourth floor, Belfor takes down the shelving for removal. August 2, 2018. Book shelving parts are piled in an alcove on the fourth floor. August 2, 2018. Obviously, most of our collection will be unavailable during the 2018-19 academic year. However, we still have access to hundreds of databases and other online resources. Current periodicals are located in the Math and Physics library. Course reserves are available so students can access textbooks and other materials at Library Help in the Union. Interlibrary Loan is up and ready for requests if we don’t have what you need. Have questions? Contact us via Ask a Librarian! And again, if you’re looking for help in person, visit Library Help in the Union, which is located across from Radina’s, or stop by one of the other library locations (Math/Physics Library, Weigel Library of Architecture, Planning & Design or Vet Med Library). 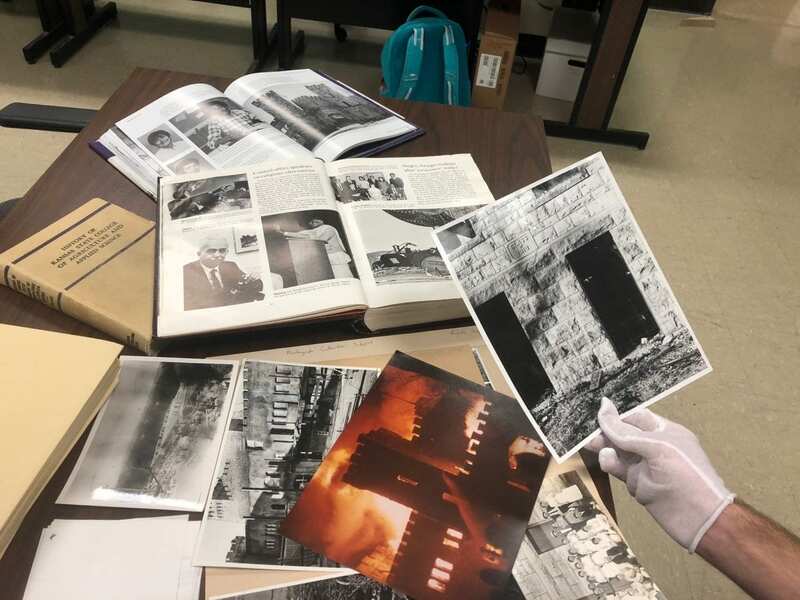 Kathryn Talbot, K-State Libraries’ preservation coordinator, was at home when she received the call about the Hale Library fire on May 22. After that call from Michelle Turvey-Welch, the Libraries’ head of metadata and preservation, Talbot came back to campus feeling relatively calm. But when the firefighters were still working four hours later, Talbot knew that she needed to ask Turvey-Welch for permission to call companies that manage large-scale emergency recovery and restoration. 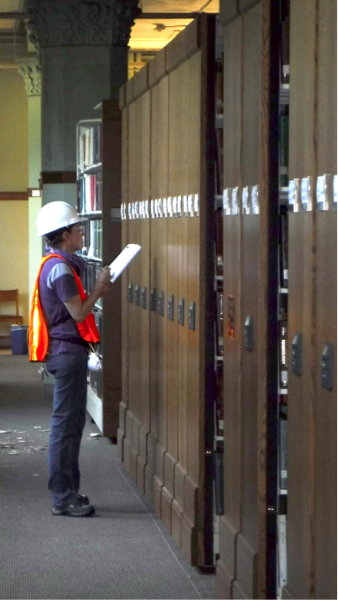 More than 200 BELFOR Property Restoration employees have been working on the Hale Library recovery effort for almost eight weeks. June 21. 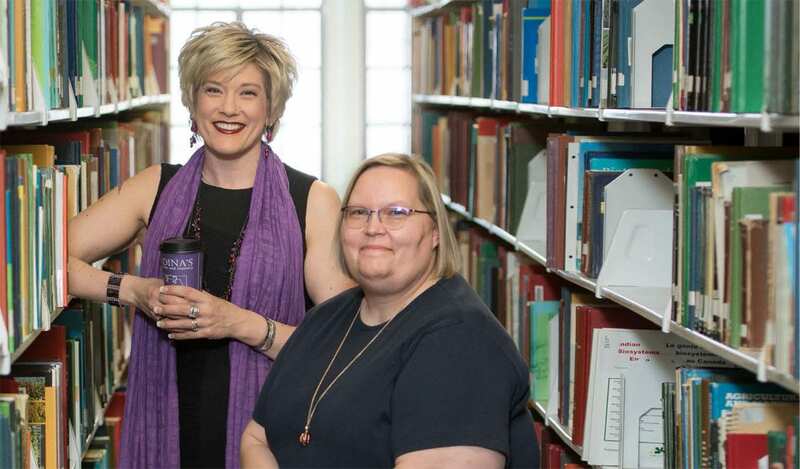 As K-State Libraries’ disaster team lead, it’s Talbot’s job to prepare the organization’s employees for the unexpected and to know whom to call in an emergency. 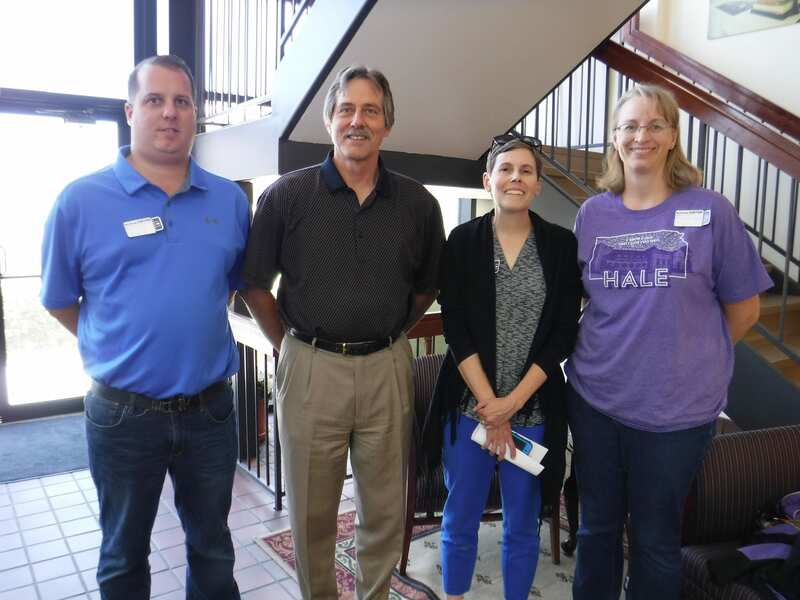 By preregistering with disaster recovery companies, Talbot insured that K-State Libraries would be a priority client in case of a large-scale crisis. For example, in the instance of a tornado that affects multiple organizations, the disaster recovery company helps preregistered clients first. That was only one element of the team’s preparation, though. Every office was supplied with one of the team’s red “disaster plan” binders, and they stocked strategic points throughout the building with emergency bins and supplies. Hale Library’s Great Room. May 24. Once Talbot had made contact with BELFOR Property Restoration, she also called the American Institute for Conservation (AIC), which has a round-the-clock response line. “I wanted their help in thinking through the situation and knowing which questions to ask the next day,” Talbot said. In the following hours, as the extent of the damage became apparent, Talbot had plenty of questions, but answers were in short supply. 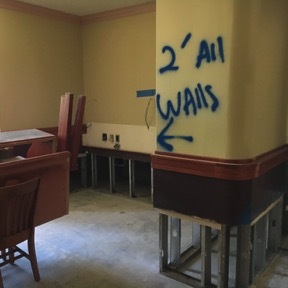 She described her experience as she walked into Hale Library for the first time post-fire on Friday, May 25. Talbot at work in the stacks. July 5. Talbot went through the building with Belfor staff members who specialize in handling collections and documents after an emergency. They helped prioritize which areas of Hale Library would be addressed first: Room 117 on Hale Library’s first floor suffered the most water damage and the books had to be packed out right away. Talbot, Turvey-Welch and other employees worked to capture the call number ranges on every shelf of every book case in Hale Library. 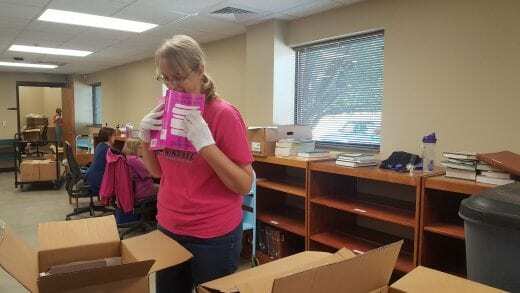 They were written on corresponding boxes and entered into spreadsheets so there is a controlling guide that will help her team keep the 1.2 million volumes in order. When the Libraries aren’t in crisis, Talbot’s job looks much different. Typically, her main job duties include managing digital preservation and supervising all staff that handle aspects of physically moving books: shifting the collections from one part of the library to another, reshelving books returned by patrons, and storing and circulating books that are located offsite at the Library Annex. She also supervises the care of general circulating collections, including binding and preservation lab activities. These days, Talbot has a desk in Unger Tower, but she doesn’t spend much time there. And is she considering a career change after everything she’s been through in the last two months and the many challenges ahead for renovating Hale Library? What happens to smoke damaged books? 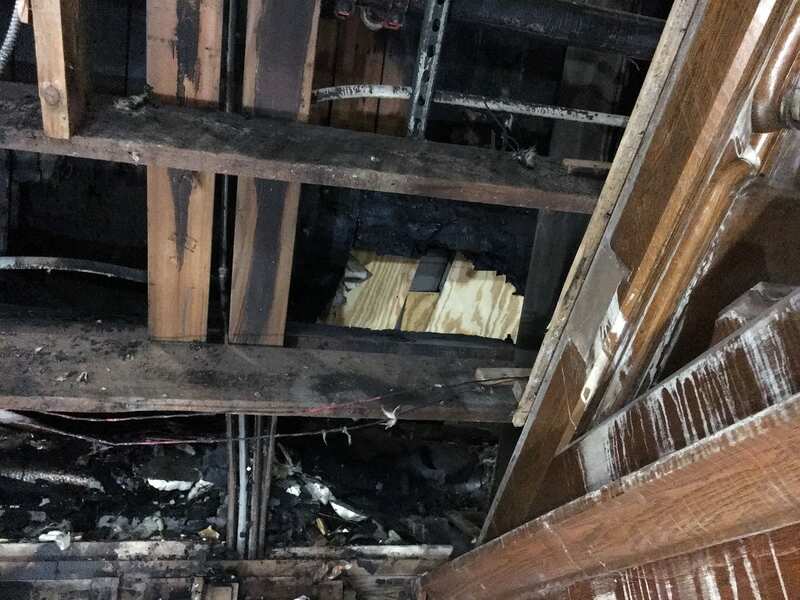 A few weeks ago we talked about what happened to the wet library books after the fire in Hale Library, but there were also over a million books in the library that suffered smoke damage and require treatment. The soot from the smoke damaged every inch of the library, and it has proven very difficult to remove from surfaces. A combination of the smoke, water, heat, and non-climate controlled building left most surfaces stained. Typically soot can be wiped away, but in this case, it is almost baked on. This resistant soot is an anomaly that Belfor, an international disaster relief organization, has not experienced before. Because this is such a strange occurrence, we sent a few books from different parts of the library to the preservationists at the Library of Congress where they will be tested and researched. Soot stains outline where books were shelved. 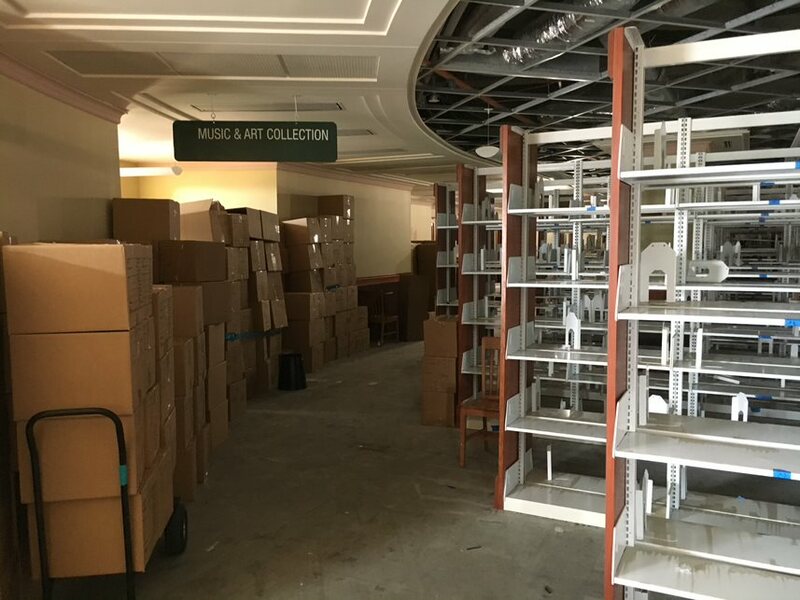 While we wait to hear from the Library of Congress, we continue to move books out of Hale Library over to Executive Court, a process Belfor has been working on since May 25. K-State leased Executive Court, an office space near the airport that was most recently occupied by the College of Architecture, Planning and Design during the renovation of their Seaton Hall Complex. As of now, books from rooms 117 and 222 have been moved to Executive Court as well as most of 3rd and 4th floors. We estimate 500,000 books are currently at Executive Court waiting to be cleaned. Executive Court before and after boxes of books were transported. To clean a soot-covered book, a HEPA vacuum is used on the book’s exterior to remove most of the dirt and soot. Next, the cover, the back, and the spine of the book are wiped down with a dry chemical sponge. After the outside is clean, the book is opened and the fore edge of the pages is fanned in both directions and wiped down. It takes about 20 minutes to complete this process on a box that holds 12 to 15 books. Kay Rieder, Belfor project manager, demonstrates how smoke damaged books are cleaned. After they go through this manual cleaning process, all of the books will go into an ozone chamber in order to neutralize the smell and draw out the carbon. Belfor has built two ozone containment centers in Executive Court. One of the ozone chambers that neutralizes odors on books. After the books are out of the ozone chamber, they go through a “white glove” quality control check. If any soot comes off the book or a smell still lingers from the fire, that book goes through the cleaning process again. Ozoning books can accelerate deterioration of items, so they will not ozone a book more than needed. 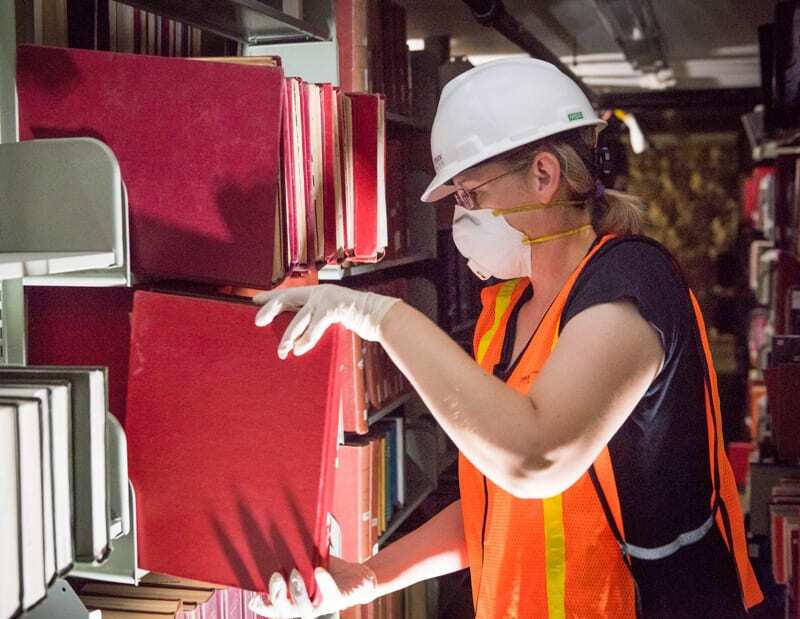 Kathryn Talbot, preservation coordinator, checks for any lingering odor from smoke on clean books. The cleaning process of some of the books has begun, but the crew cannot begin cleaning them in earnest until more warehouse space is acquired to store the clean materials. It is important not to put clean books near the carbon-covered books because the clean books would absorb those chemicals again. To keep the books in order, Belfor put grids on the floor with tape. Each shelf in the library has a corresponding grid in Executive Court. One of the challenges with Executive Court is the inability to move books on pallets, because they don’t fit through the doorways, which slows down the cleaning process considerably. Pallets allow dozens of books to be moved at the same time but instead the boxes are managed by hand and small carts. Currently, the few hundred boxes that have been cleaned were moved to the Library Annex. The annex is an offsite location near Executive Court that holds part of the Libraries’ collection. Patrons are able to request books from the annex, and then they are delivered to an on-campus library help desk. After the books are cleaned, some of the books will be ingested into the annex and will be available for check out upon request. 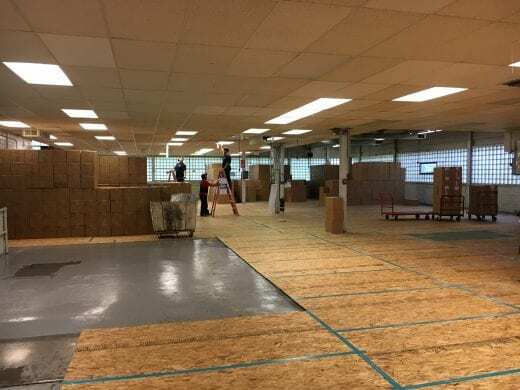 The annex is unable to hold the entire library collection, so hundreds of thousands of additional books will be sent to additional warehouse space, once it is acquired. At Executive Court, boxes are stacked seven boxes high and fill the entire building. The Libraries have received many questions as to why we don’t claim the books as a loss to insurance. For us, its not just about how much it would cost to replace them. Not only are some of the books out of print, but it would take an exorbitant amount of time for the acquisitions and collection development department to search for and purchase the material. It would be a major undertaking to replace approximately 1.2 million volumes. There is no set time frame for the books to be cleaned. As of right now, Belfor estimates it could take between six to twelve months. Today marks five weeks since the May 22 fire at Hale Library. In this update, we have a lot to share about our demolition progress. 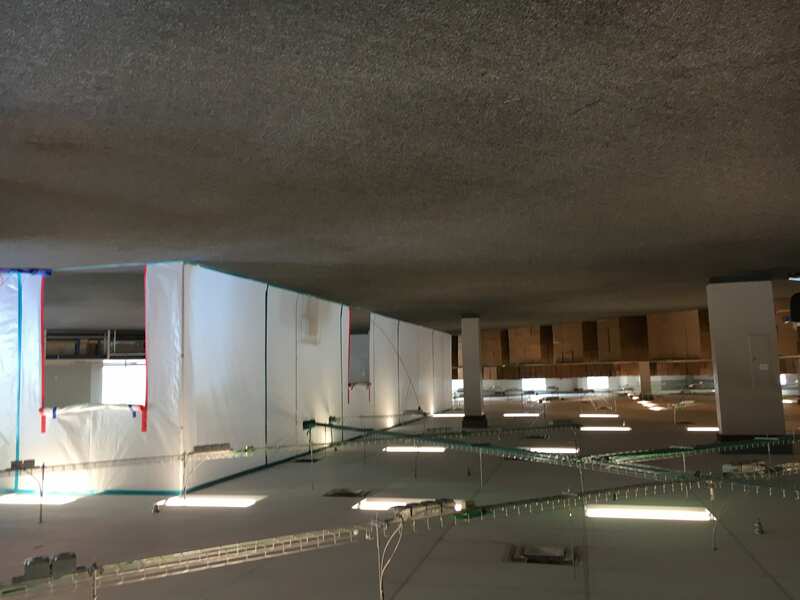 A huge amount of damaged drop ceiling, drywall and carpet has been removed. Second floor, Media Development Center, May 31, before ceiling removal. Second floor after ceiling tiles were removed, June 14. Second floor after ceiling tiles were removed, June 8. 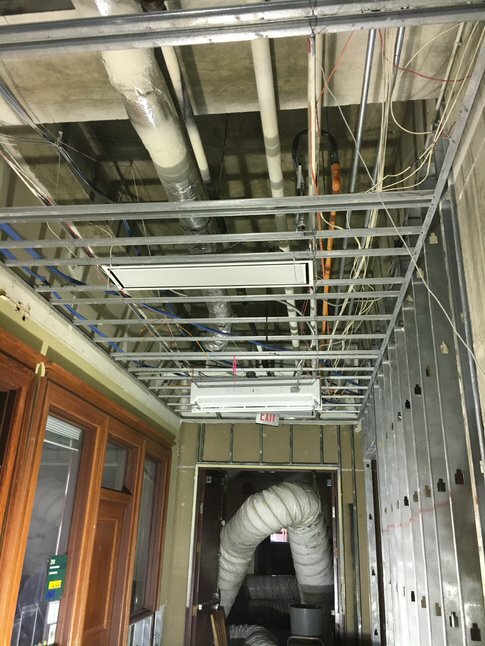 Second floor of Hale Library with all ceiling grids removed, June 14. There was also extensive water damage to the drywall. In some areas, only a few feet needed to be removed, but in other parts, the entire wall had to be demolished and only metal studs remain. 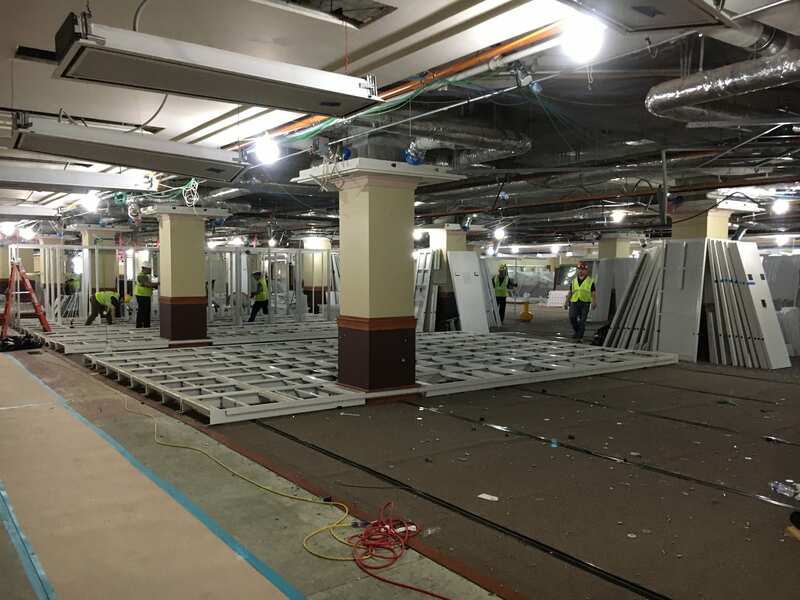 First floor, June 8. 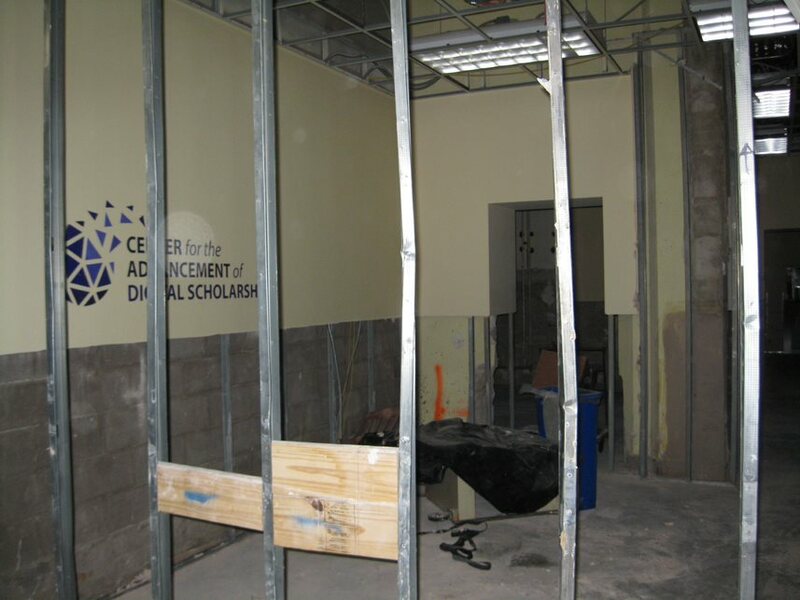 In the Center for the Advancement of Digital Scholarship (CADS), half to all of the drywall was removed. 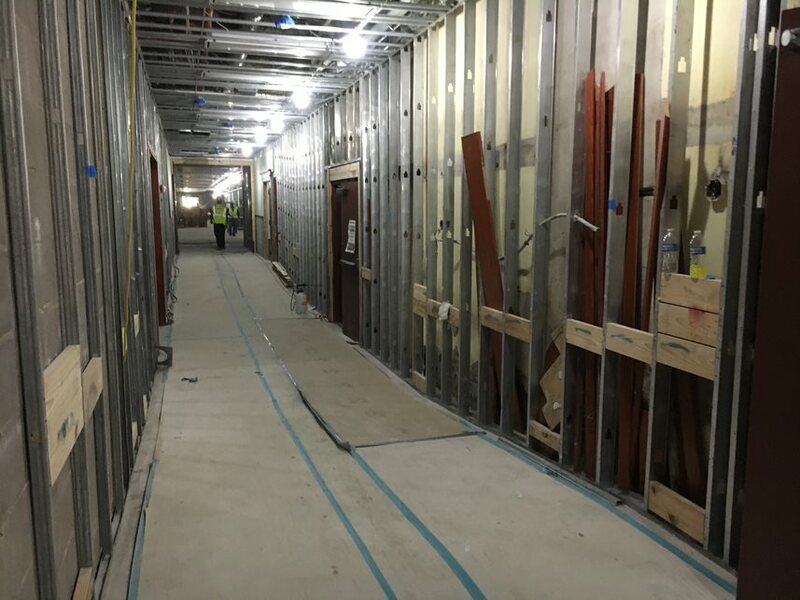 First floor, northwest corner, looking east down the hallway that runs between Room 117 and Stack A, June 14. The majority of the drywall was removed from this portion of the building. Fourth floor, Academic Learning Center, June 14. 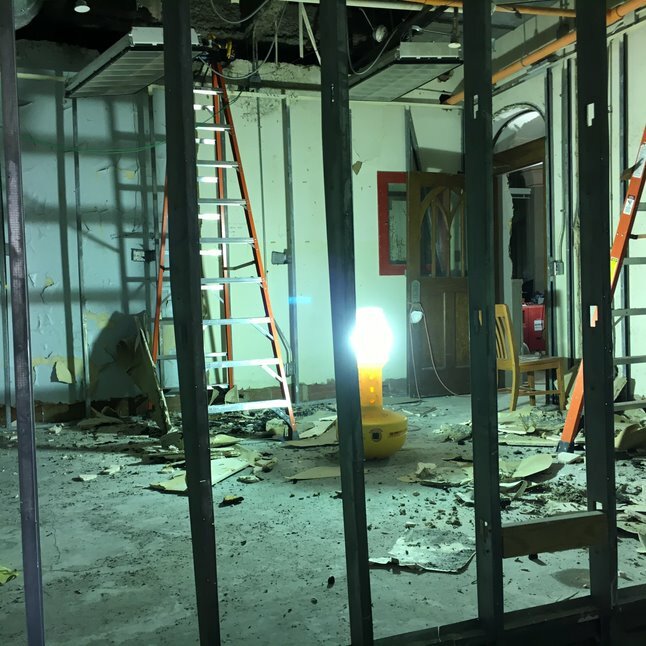 The ALC is the on-campus tutoring facility for student athletes; this space experienced extensive damage and will be gutted. 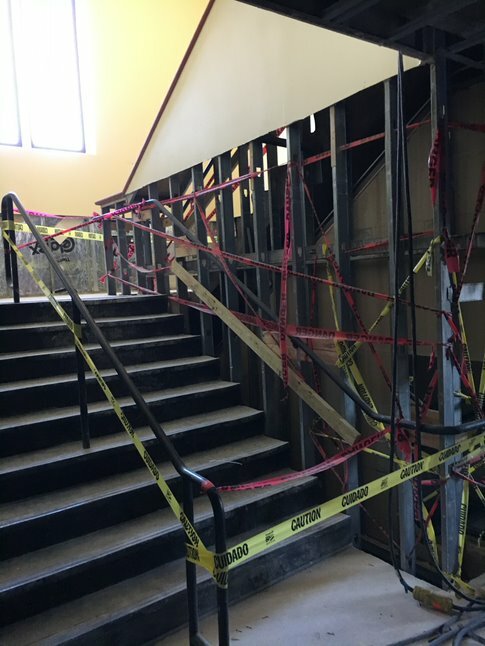 Fourth floor, north stairwell, June 14. Second floor, June 14. 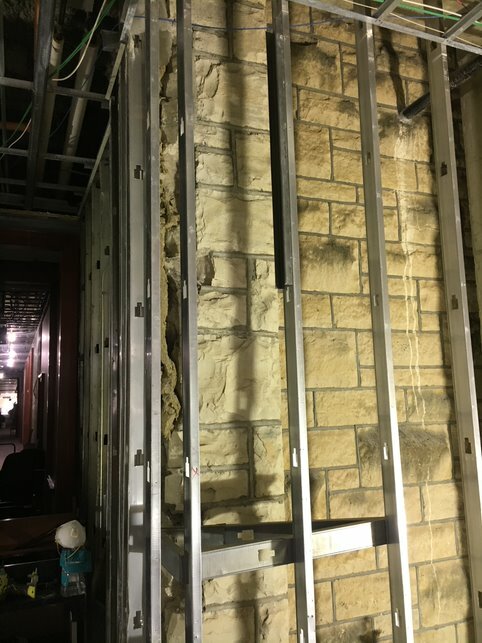 When drywall was removed, limestone from the exterior of the 1955 Farrell Library addition was exposed. Baseboards were water damaged and will be disposed of along with the drywall and drop ceiling system. Most of the furniture in the building was damaged beyond repair and will need to be thrown away. 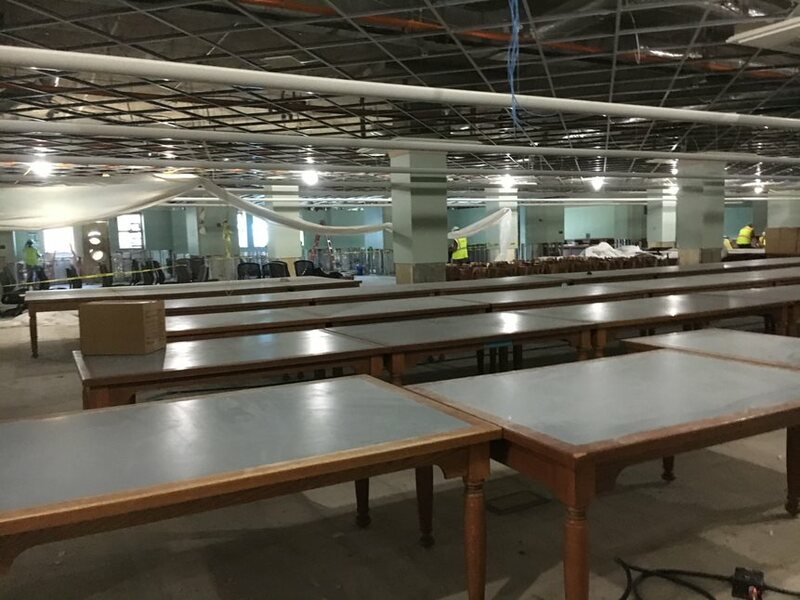 The tables that were located across all five floors of the building suffered so much smoke damage that the toxic soot cannot be cleaned off of them. Already, the majority of the furniture from the first through the third floors has been disposed of. All told, it filled a large industrial dumpster 65 times. Because the soot from the smoke is so toxic, every inch of ductwork in the 550,000-square-foot building will need to be taken down and professionally cleaned. In addition to the ductwork, all surfaces of every room will have to be professionally cleaned to eliminate the soot. Cleaning the first through fourth floors could take about ten weeks. The tables sustained a significant amount of smoke damage. Most have been disposed of. 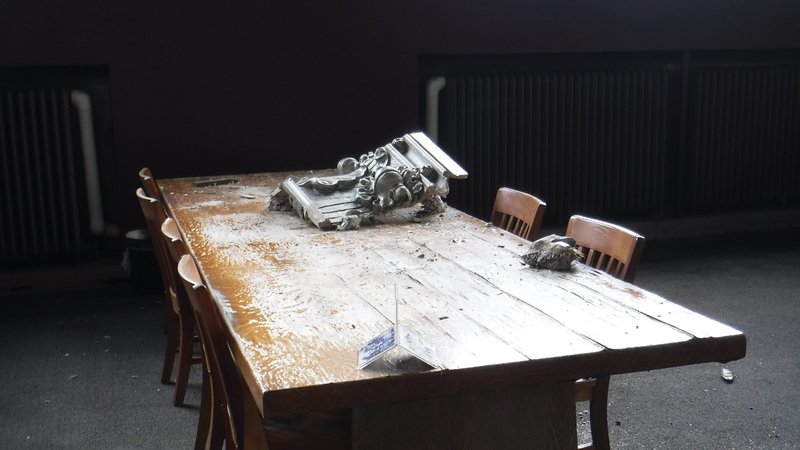 When loose items that were left on the tables were picked up and moved, it was easy to see how much soot coated all surfaces throughout the building. 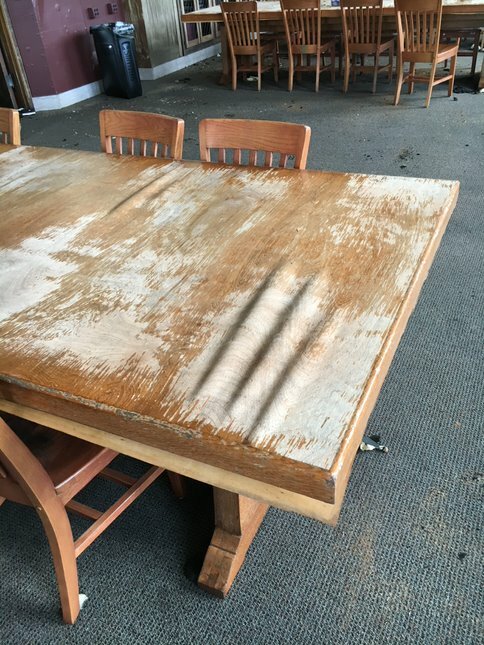 The original Farrell library tables suffered intense water damage that stripped and warped the wood beyond repair. These photos were taken two days after the May 22 fire. The Great Room tables sustained a significant amount of water damage. Both the veneer and the underlying wood was cracked and warped from prolonged exposure to water. Luckily, not everything was completely unsalvageable. 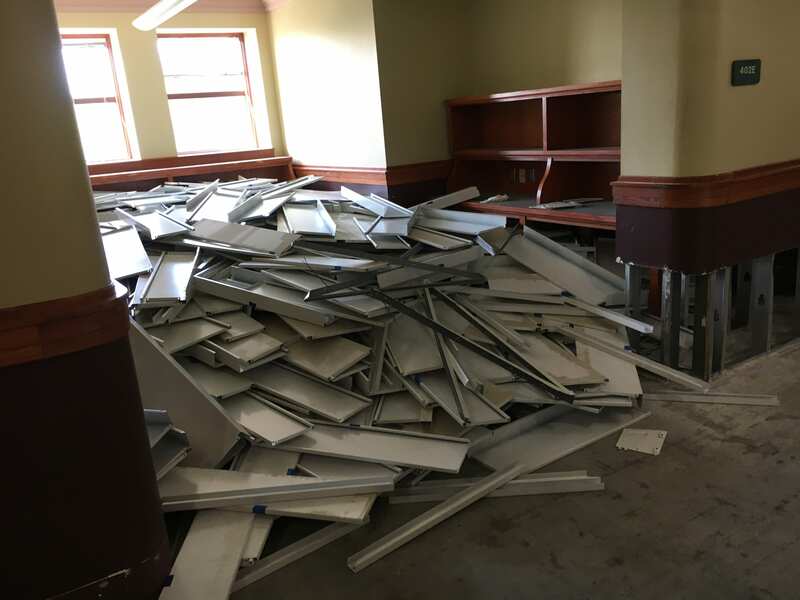 While removing books, the crew and staff were in desperate need of book carts and were able to salvage 30 book carts from the fifth floor. Progress continues on the book retrieval process. 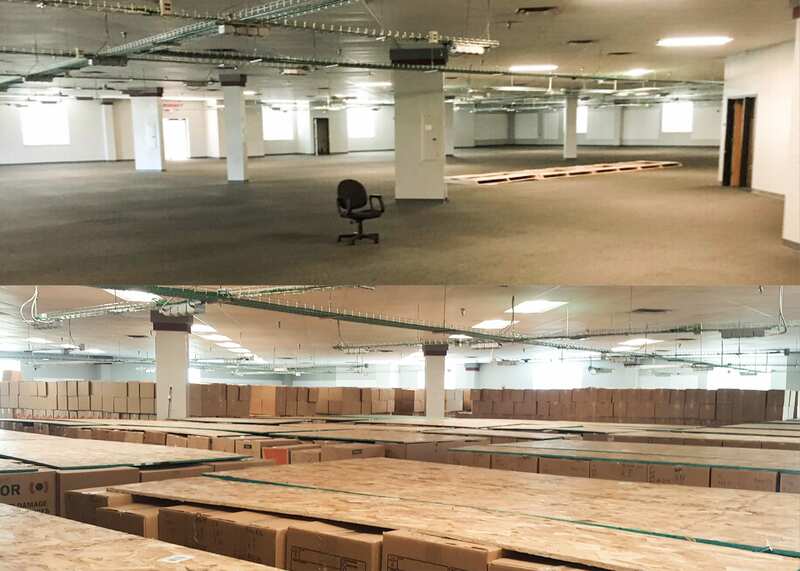 At this point, 30,000 full boxes of books have been removed. 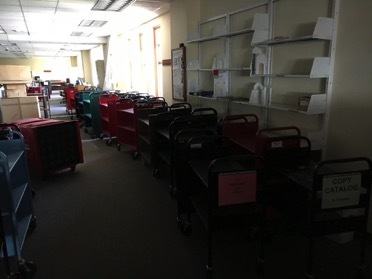 Book carts, fifth floor, June 14. This is just a small percentage of the boxes that are ready to be assembled and packed with books that will be relocated relocated offsite for cleaning and storage. The entirety of the Music and Art collection has been boxed and moved off of the fourth floor. 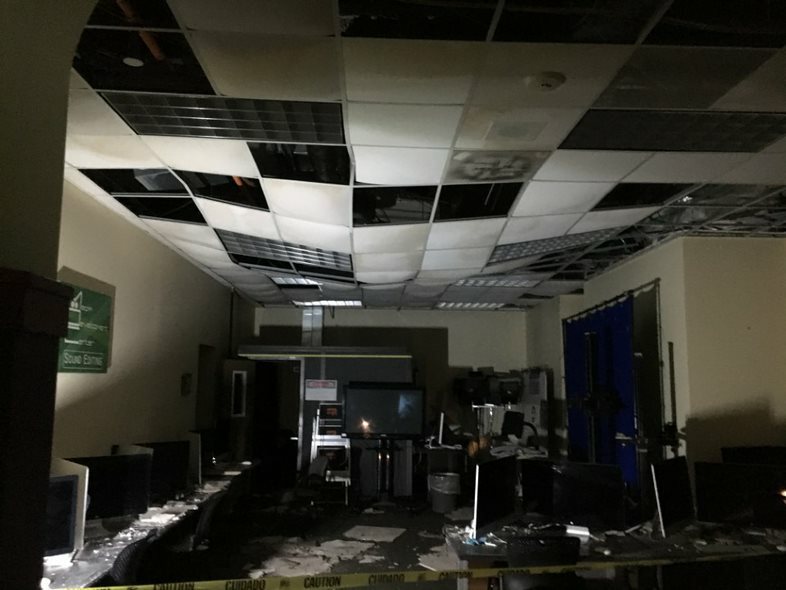 In the last week, the data center, which had been operating off of generators, was returned to commercial power. 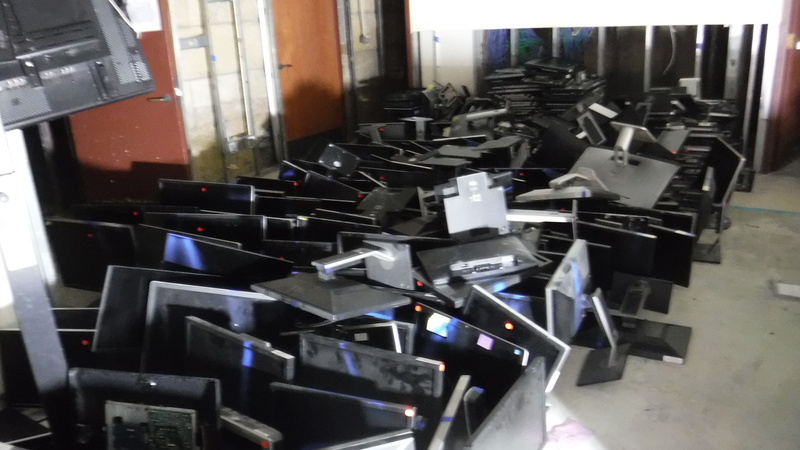 Additionally, the electronics in the building have been assessed, and about 70 percent of what was deemed a loss has been prepared for disposal through the e-waste process. Damaged computers waiting for the e-waste process. Obviously, there are many moving parts to the recovery process. 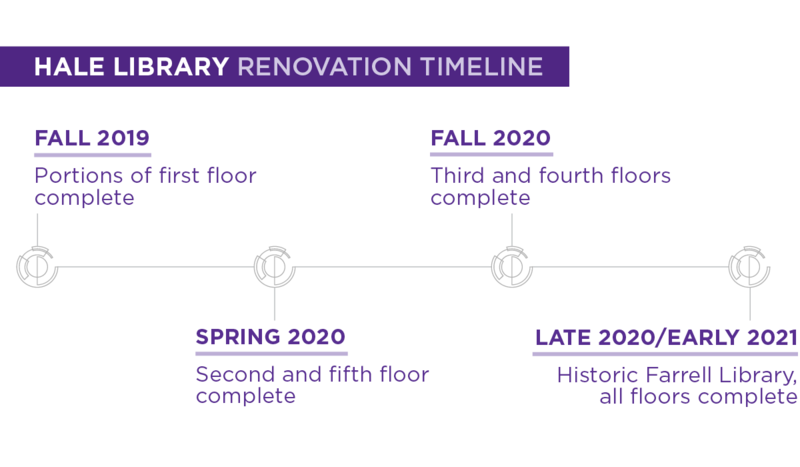 Before we can implement our plans for K-State’s future Hale Library, the damaged portions of the building must cleared out. We are making strides forward every day. We’d like to extend our deep appreciation to our K-State Libraries and Information Technology coworkers and the Belfor team for everything they’ve accomplished thus far. What happens to wet books? After the fire it was critical to address the issue of damaged books, especially those that were wet. 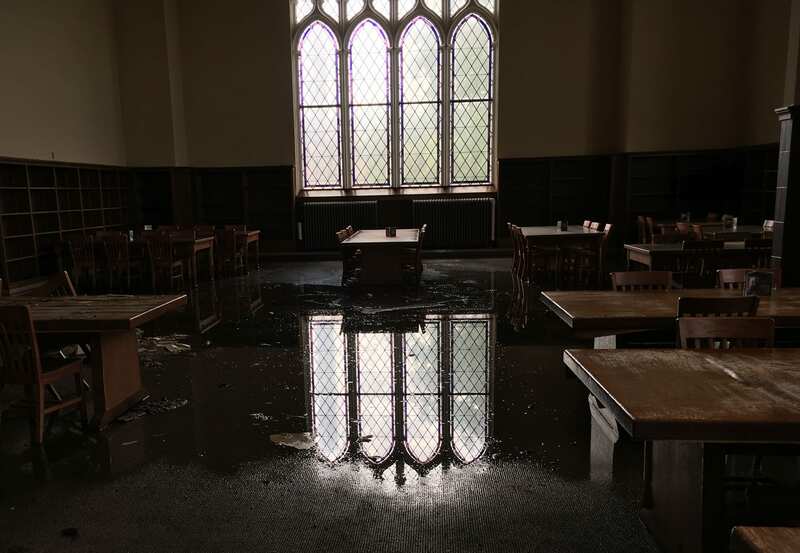 Hundreds of thousands gallons of water were used in the rescue effort, and that water drained down into different parts of the library like Room 117, which was full of books stored on compact shelving. Room 117 covered in ceiling tile debris from water damage. 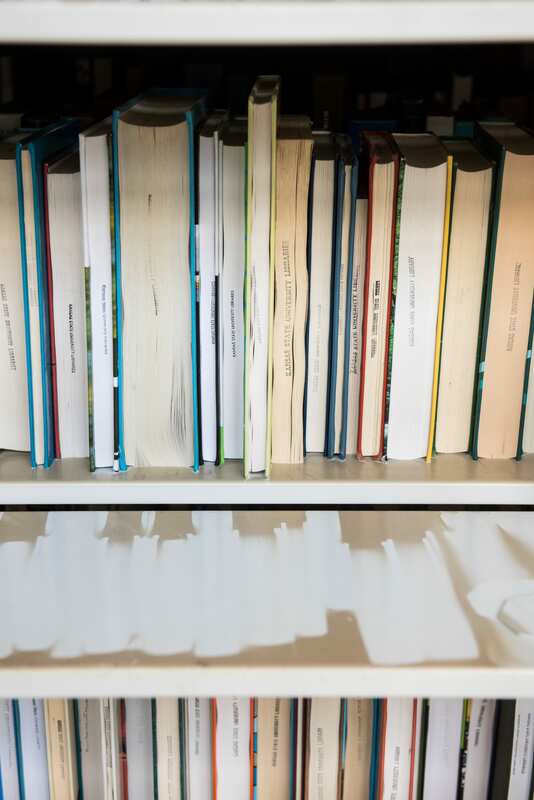 In order to preserve wet books it is best to freeze them. The process of freezing the book turns the water into a solid and stops further damage and mold growth. The majority of wet books were part of the circulating collection housed in Room 117. 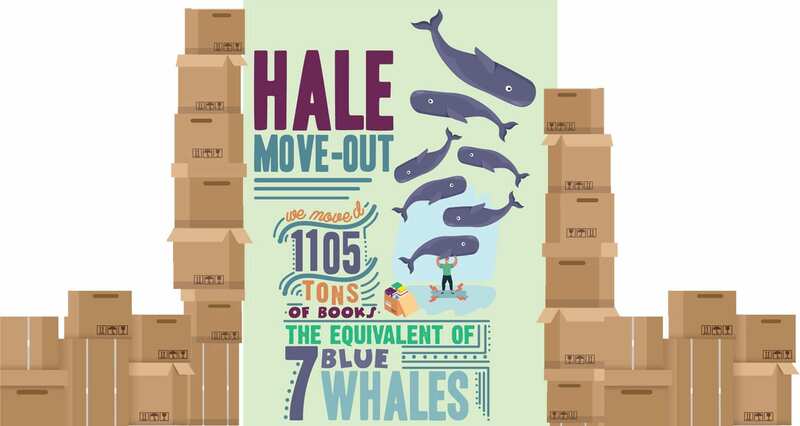 At this point, 3,357 boxes of wet books have been transported out of Hale Library. Packing and gathering books is a long process that has been complicated by the fact that library personnel could not enter the building for several days. 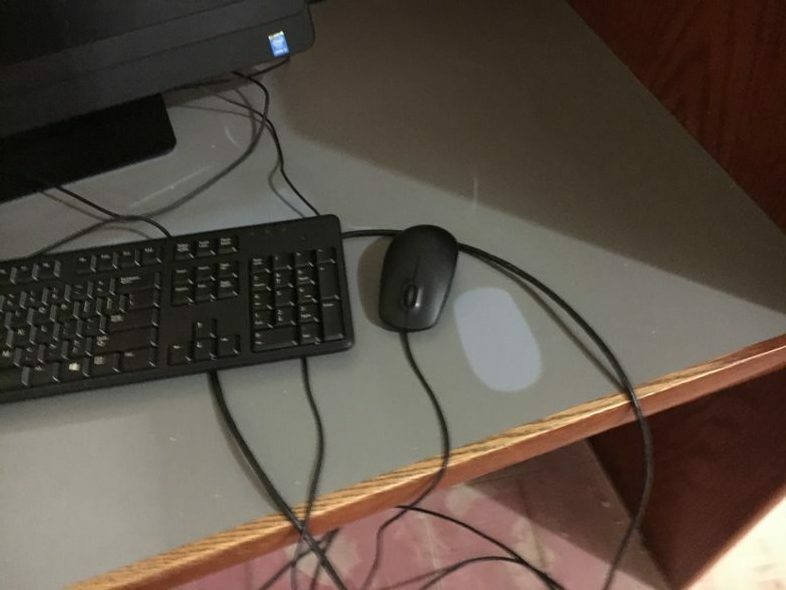 When they finally could start working, the water damage had left the building with no power. In some places, shelves of wet books started expanding so much that the pressure lifted them off of the shelves. Since the books were stored on compact shelves powered by electricity, at first they couldn’t move the shelves to access the books. Compact shelving moves on chain-link rails, which allows for libraries to provide more books in less space. 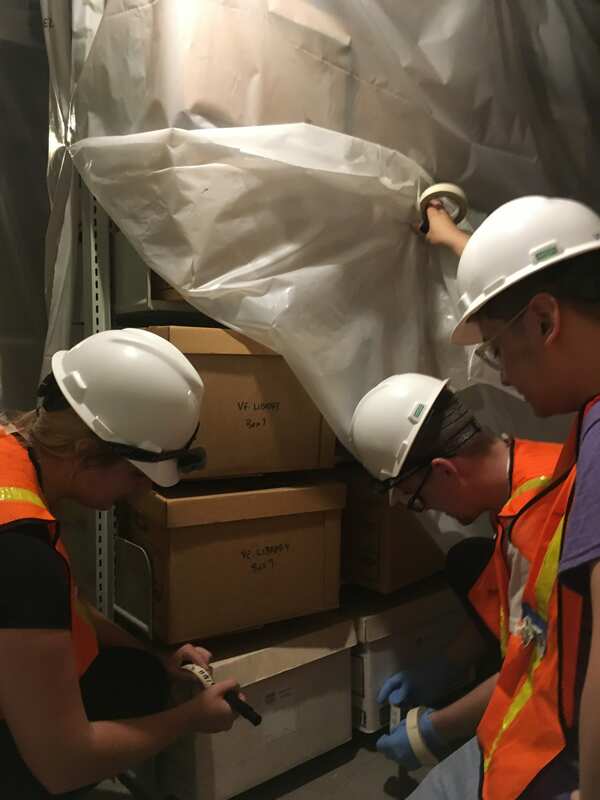 “We were unable to initially power up the shelving in Hale 117 with battery back-ups, so our wet materials stayed in un-airconditioned, nonclimate-controlled conditions for a number of days,” said Michelle Turvey-Welch, Head of Metadata, Preservation, and Digital Initiatives. 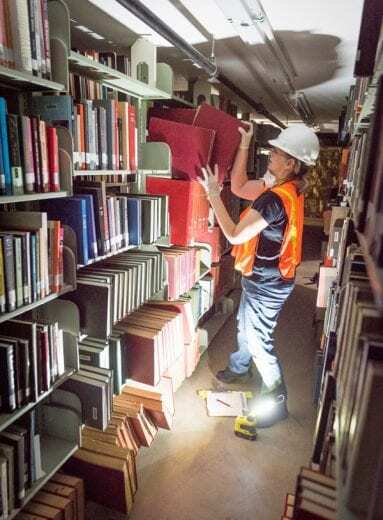 Michelle Turvey-Welch surveys the compact shelving after the fire. Once a professional came in to remove the chains on the rails of the compact shelving units, the process of moving wet books became easier. There is an established protocol that preservationists use when freeze drying books. First, they need to be packed in a specific way: They must be placed spine down in a box that has been thoroughly lined with heavy plastic. Then, those boxes need to be tightly packed in order to help the books maintain their shape. Boxes that the wet books go into are lined with contractor-grade trash bags to prevent moisture from destroying the cardboard during transportation. Next the boxes are sent to the freezers where they sit for anywhere from several days to several weeks depending on how wet the book is. Housing and Dining Services at K-State was kind enough to loan us the use of their industrial freezer, which is located in the Pittman Building. The freezer is anywhere between negative ten and negative fifteen degrees. Wet books sit in the Housing and Dining Services freezer before they are transported to Ft. Worth, Texas. 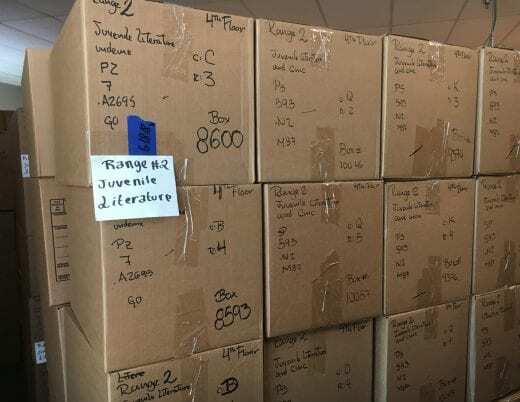 The books that were in the freezer have been loaded into refrigerated trucks and shipped to a Belfor regional technical service center that specializes in water damaged documents and books in Ft. Worth, Texas. The wet books will be put into vacuum freeze dryers that will draw out the rest of the moisture and turn it to water vapor. Then the books will undergo the final restoration and cleaning process.